In an era in which unsolicited emails account for more than half of global email traffic, and email phishing campaigns are reportedly increasing by 400% per year, implementing an email filtering service is less of an option for businesses and more of a necessity. Although a basic filtering service exists on most email platforms, spammers and hackers are becoming more sophisticated in how they operate. Basic email filters do not have the complexity to recognize sophisticated spam messages and can often allow obvious spam through or label genuine emails as spam by mistake. With online security experts universally agreeing that the volume of unsolicited emails and email phishing campaigns is only going to increase, businesses can enhance their security profiles and mitigate the risks from email threats by implementing a professional anti-spam email filtering service. Spam email is more than just an inconvenience to businesses. Although it takes on average just 4 seconds for an employee to recognize a spam email and delete it, research conducted by Microsoft concluded that lost productivity due to spam email costs the global economy just short of $20 billion per year. However, a bigger financial cost to business comes from email phishing campaigns and emails containing malware. The cost of removing malware infections, recovering data and paying regulatory fines was estimated at $491 billion globally in 2014 in a joint study conducted by the International Data Corporation and University of Singapore. By comparison, the cost of an effective email filtering service is negligible. Most professional services are now hosted in the cloud – eliminating the need to buy hardware – and it typically costs around $10.00 per employee per year to implement a professional anti-spam email filtering service depending on the size of an organization. Email filters catch and quarantine spam emails and those considered to be unsafe using multiple security mechanisms. These include blacklists of senders and websites that have been detected in previous unsolicited emails, sender policy frameworks and Bayesian analysis. The mechanisms are updated in real time to prevent any recently created spam avoiding detection. Robust anti-virus engines also inspect incoming emails for malware or links to websites that hide their true identity behind a proxy server. These emails are also quarantined and included in reports that enable system administrators to determine whether the quarantined emails should be delivered to the account holder (the sender may also be whitelisted to prevent future blocking) or deleted. One other important role of an email filtering service is outbound scanning. Outbound scanning prevents spam and viruses from being sent out by a business, and avoids the business being blacklisted as a spammer by global blacklisting services. The consequence of being blacklisted is that business emails are captured by other spam filters – interrupting the business process and damaging productivity. Experts estimate anywhere between 70%-95% of all email transmitted daily is spam. This is why there exists published public blacklists of mail servers that have been relaying spam. These lists allow other mail servers to check if they’re receiving an email from a server’s IP address that might have possibly been flagged for sending spam in the past. Selecting the best email filtering service can be difficult. There are a number of vendors in the market claiming that their product is the “best”, and often their claims are supported by affiliate marketers. Affiliate marketers benefit financially from ranking one particular email filtering service above another, confusing the process of evaluation further. Can the claimed levels of spam and virus detection be verified? What percentage of emails are blocked by mistake (known as false positives)? Will the email filtering service be compatible with your existing system? Does the service have recipient verification to reject emails sent to non-existent addresses? Is the service scalable so that the level of service can be increased or decreased as necessary? Does the vendor have knowledgeable and reliable customer support? These are just some of the considerations to look at when choosing an email filtering service or solution. The vendor should also be able to provide you with verifiable testimonials or, at least, testimonials that match the sentiments found on reliable Internet review sites. Once your questions have been answered to your satisfaction, only then should you consider the comparative cost of the best email filtering service from your shortlist of vendors. We offer two email filtering solutions – SpamTitan Cloud and SpamTitan Gateway – both of which are fully scalable and guaranteed to be compatible with every operating system. Both solutions offer a number of Recipient Verification methods (DRV, LDAP, list-based, regular expression, etc.) and settings that allow businesses to control the login authentication method for each domain. Naturally SpamTitan also scans outbound mail to prevent IP blacklisting, and our service is complemented by industry-leading customer and technical support. 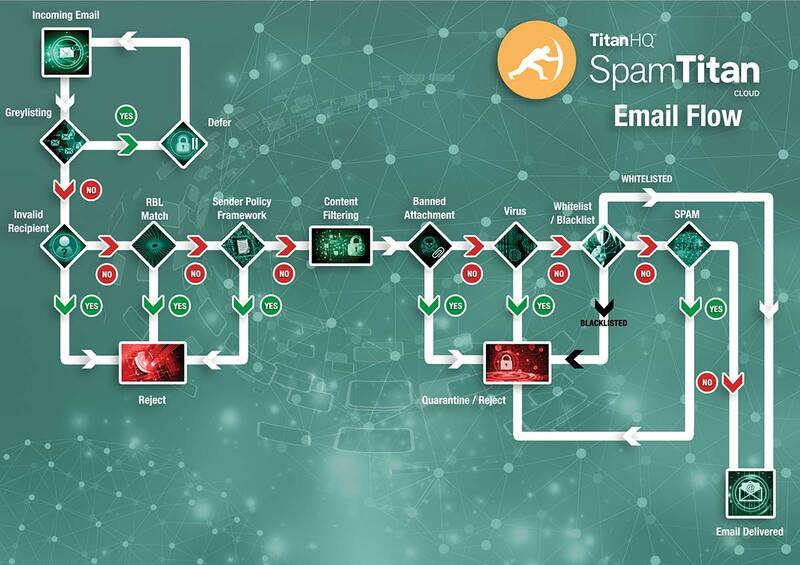 Since our company was launched in 1999, more than 5,000 customers have chosen SpamTitan´s email filtering service to eliminate 99.97% of unsolicited and unsafe emails in order to enhance their security profiles. SpamTitan is easy to set up and requires minimal technical support or maintenance to keep your system virtually free from unsolicited and unsafe emails. Our web-based portal has an intuitive interface that makes managing your email security easy, and our suite of reports are uncomplicated and simple to understand. But don´t take our word for it. Try SpamTitan free for thirty days and see for yourself. We are offering all businesses and managed service providers the opportunity to trial run our email filtering service free for thirty days. Our offer does not tie you into a commitment and is a fully enabled trial of our complete service. If you subsequently choose to continue with our service, we have a range of subscription options to suit every size of organization and every budget. To take advantage of this opportunity simply call our Customer Services team today. One of our experienced engineers will explain how you can be up and running within minutes and guide you through the installation and configuration procedures.Make life easier for yourself, your IT department, and all your employees with an email filtering service from SpamTitan.